School has only been back for three weeks but it's already been a whirlwind. I can't believe September is already here. Picture day is around the corner. I know all my students' names and we're starting our first novel and writing pieces! Whoa! Now, if only I could master the art of having multiple versions of myself to read with them so that I can give them all a guided reading level by Tuesday.... yeah, probably not going to happen. But, I'm finally getting into the swing of things and thought I'd link up with Michele at Run Miss Nelson's Got the Camera and share some of my school and "non school" moments so far. Reader's Workshop has been going really well this year. My students are really enjoying reading and have already selected some great books from the library! I found these chevron "ottomans" at Kohls on clearance in the dorm/home goods department. They were originally $60 each! Yikes!!!! I was able to buy one for $10 dollars and two more for $15 a piece. Now my library has some seating since I threw all my old floor pillows away last year. They are fifth grader approved and so far I haven't found any surprises in the "hidden" storage. Iggy's not sure about this whole "grading" business. He was definitely not fond of the fact that I had to spend so much time grading reading logs when he wanted to play with his whale toy. Who could resist that cute little face? I had to do some serious multitasking. Hopefully, I can stick to my resolution and keep grading at school for next week! This morning, I decided to put off grading and relax with some coffee and slippers. It was just what I needed after the longest short week. Sometimes you just need to put your feet up and stop and smell the coffee. After coffee, I stopped off at Target. I picked up a few more clearance school items before they're all gone. I found a copy of Peter Pan for my library for .50 cents. I also found a reading comprehension book for .50cents and a pack of stickers for $1.00 on clearance. I also bought some pencil grippers because a few of my students are holding their pencils really strange - thought it might help. The rest of the stuff on the table is a new seating chart I need to create this week and word wall words for our Native American unit I need to laminate for Monday. In a non school related picture, this summer my mom and I really got into canning along with my cousin and aunt. My mom has most of the supplies so I'd go over a few times during the summer and we'd have canning days and try our luck. My mom proved to be a way better canner than I but I still had a lot of fun! We canned many things from our own gardens and from the local farmer's market. Tonight for dinner I enjoyed some our cucumber, onion, and pepper salad. It's sooo delicious and easy to make! I'm so sad that I only have two jars left. I guess that means that fall really has arrived. 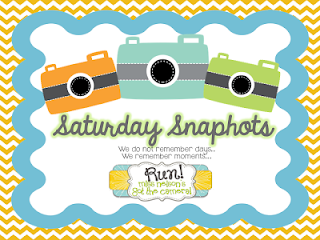 Don't forget to link up with your Saturday Snapshots! Hope everyone else is snapping away as back to school is in full swing! Those ottomans are lovely! Enjoy the rest of your weekend! I love the ottoman. I wonder if the Marshall's in my town would have any??? They are really cute!!! Thanks for sharing. Those Peter Pan erasers look adorable. Is your dog an Italian Greyhound (I want to get one some day), he is precious!